Did Thomas S. Monson Really Speak at Every one of "His 85 Widow's" Funerals? Following the death of President Thomas S. Monson, the Mormon Church stated that Monson had attended ALL 85 funerals of the widows who had been in his ward when he was a Bishop. “Although his Church callings and responsibilities over the years have often taken him on the road for weeks at a time, President Monson made it to every funeral of his widows and spoke as he had promised them he would. “. In this article, I contend that it isn't true. He served three years as a Mission President in Toronto. From 1968 to 1995 he was the Apostle over much of Europe. It is possible some are still alive. I don't believe that anybody really kept track of the widows/funerals. Did not a single widow ever move away and he lost track? Why would he take over the job of the Bishop of the ward when they died? In about 1956 we recognized that our neighborhood was dete­riorating. We observed this one Halloween by the nature of the people who came in the guise of ‘Trick or Treat.’ The minority elements were moving into the area where we lived, and many of the old-time families had long since moved away. Seeking coun­sel, I visited with Mark E. Peterson, who for many years had been the General Manager of the Deseret News. O. Preston Robinson, my former professor of marketing at the University of Utah, had suc­ceeded Brother Petersen as the General Manager at the News. As I mentioned to Mark my dilemma, wondering if it would be unfair for me to move, he said simply, ‘Your obligation to that area is concluded. Why don’t you build a house in my ward?’” (On the Lord’s Errand: Memoirs of Thomas S. Monson, 1985, p. 184). Why does it matter? Because the truth is important and the "One True Church" should not lie. It seems like subsequent Bishops might have spoken instead. While he was away on assignment in Europe for months at a time as an Apostle were there no funerals? Some articles have said that many of the widows were from World War II soldiers. That would mean the women could have been about Monson's age. Are some still alive?
" He promised to speak at their funerals - All Eighty-five - and he made it to everyone, though he sometimes had to slip out of a meeting or fit the service in between general conference sessions." Thank you for your inquiry. President Monson himself talked about this. It is written in his biography To the Rescue, written by Heidi S. Swinton on page 142. The page is attached. Sister Swinton, in your biography of President Monson you say, “ he promised to speak at their funerals, all eighty-five, and he made it to every one.” You don’t list a source for that statement. Where does that information come from? Her response: "Directly from him". Well no, Church History Library people, a Biography is not the same as an Autobiography, and the biography you cite does not quote President Monson, it states an unverified story. Further Edit: The more I research here the more I feel like it is another case of story embellishment. I think it may be related to this talk by Jefferey R. Holland from 1986. "Furthermore, these sweet folks never seem to die until Brother Monson is back in town from his many assignments, enabling him to speak at their funerals. Perhaps no one in the present leadership of the Church has spoken at so many funerals—he once had three services in one day." 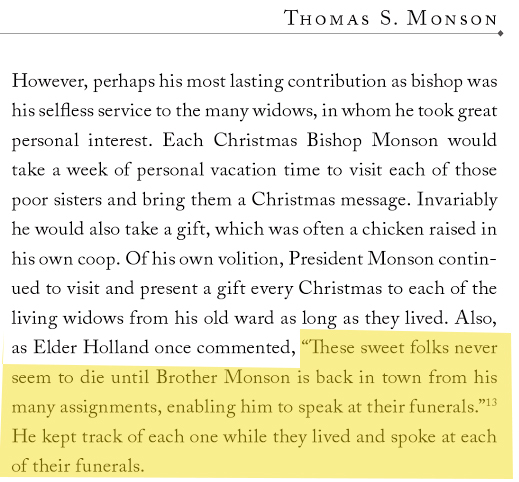 Although this quote by President Holland doesn't specifically say he spoke at Every Single funeral, I can see how the Monson Biographer might have taken it to mean that. Of course, this quote was from 1986. More than 30 years before President Monson's death. A TIMELINE of President Monson's Death that might help clarify. Was in a Stake Presidency. 1955 - 1959. Let's make a rough assumption that when he became a Bishop in 1949, his 85 widows had an average age of 70. 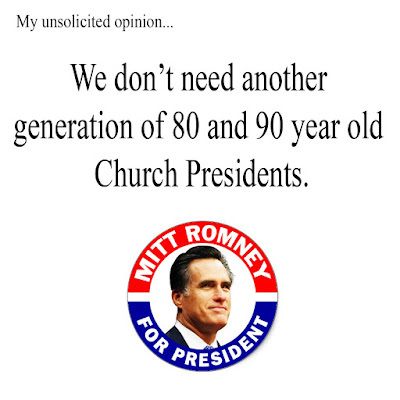 That would mean that while he was on his mission for three years they averaged in age from 79 to 82. Does my logic make sense? So during the three years, he was on his mission, not one widow died? Talk by Thomas S. Monson in 1981 where he talks about visiting widows. LDS.org Biography of Thomas S. Monson quoting book several times. USA Today Obituary says, "he was a spiritual leader for about 1,000 church members, including 84 widows, many whose husbands had died in World War II." Many of the widows were from World War II soldiers. That would mean the women could have been about his age. So some may still be alive. "He continued visiting them in their declining years and, somewhat miraculously, has been able to speak at each of their funerals-all 84 of them!" This is the oldest reference I can find to the story. Furthermore, these sweet folks never seem to die until Brother Monson is back in town from his many assignments, enabling him to speak at their funerals. Perhaps no one in the present leadership of the Church has spoken at so many funerals—he once had three services in one day—and always very personal remarks are given for the sometimes ordinary and otherwise unknown souls that he has met and loved somewhere during his ministry. Interesting that it says, "One way that this attribute became part of his life was in the way he served the 84 widows in his congregation while he was a young bishop and for decades afterward. He said that they all asked him to speak at their funerals, assignments he was happy to accept notwithstanding heavy travel and other commitments." Somebody on Wikipedia gave this quote as a reference for the fact that he spoke at every funeral. From 2008 Biography Book about the Prophets. References 1986 by Jefferey Holland almost implying that he spoke at every funeral, the book takes it one step further and says he spoke at each of their funerals. In 1949, he served as a bishop for two Salt Lake City congregations leading about 1,000 church members. More than 80 were widows whose husbands died in World War II. He regularly visited each one and promised to speak at their funerals one day, according to Religion News. 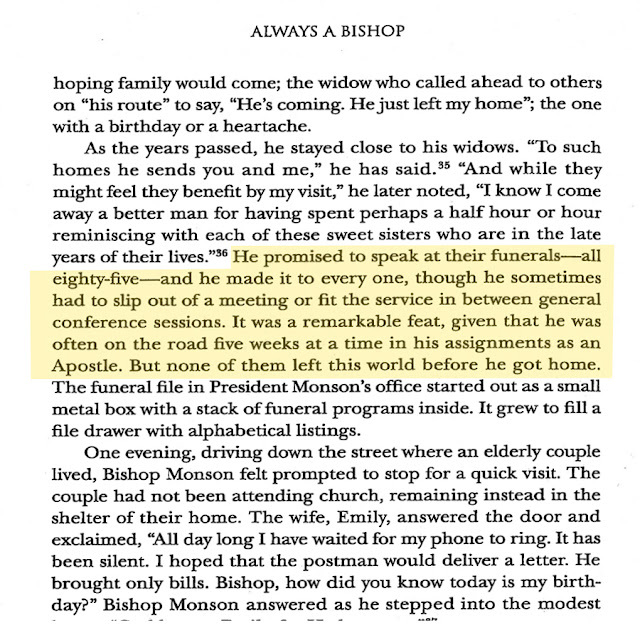 Sister Swinton, in your biography of President Monson you say, “ he promised to speak at their funerals, all eighty five, and he made it to every one.” You don’t list a source for that statement. Where does that information come from? "Directly from him". Romney is qualified, faithful and would give the church positive exposure. It would be a win, win for everyone but Bednar. If the Law of Common Consent is really a thing, can "we" as a united membership, nominate him?